Keep in mind this is the resolution for a single two event measurement, we can achieve even better resolution by averaging multiple measurements together to eliminate random noise. Of course this is at the cost of decreased measurement speed. 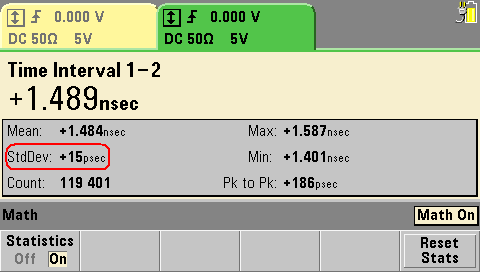 Now SSR resolution is most often associated with time interval measurements, but every counter measurement basically comes down to timing so the better the SSR of a counter the more digits of resolution you get in a frequency measurement. I am going to give a quick demo that calculates the SSR of the 53230A prototype sitting at my desk. The setup I use for the demo consists of the 53230A universal counter, 33522A function generator, two BNC cables, and a BNC tee. A continuous squarewave is first fed to channel 1 of the counter and then it passes through the other BNC cable to channel 2, as shown in the figure (sorry for the pic quality it was taken with my phone). Since the counter is measuring the same event (rising edge of squarewave) out of the function generator on both channels we can ignore the jitter on the signal from the function generator. 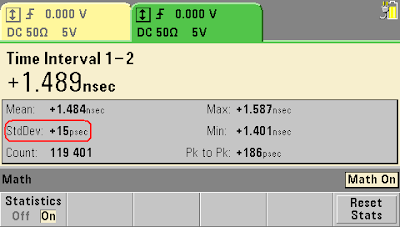 Now we are not interested in the actual time interval measurement of the counter because we don't know the electrical length of the BNC cable between channels 1 and 2. What we are interested in is the standard deviation of the time interval measurement we get using the counter's statistics capability. As shown in the screen shot, we get a standard deviation of 15 ps (circled in red). If we assume all of the time interval measurements are within 3 standard deviations, then the max resolution we are seeing in this two event measurement is about 22.5 ps. 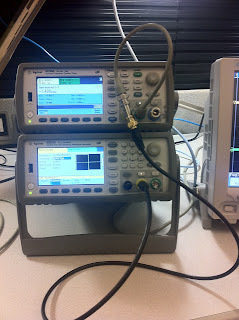 Now to get the SSR of the 53230A at my desk we have to use RSS backwards on 22.5 ps. The answer is approximately 16 ps, which means the 53230A at my desk is well within the industry leading SSR spec of 20 ps! جميعنا يقلق كثيرا عندما يضطر الى النقل لمنزل اخر او شراء منزل او شركه وفرشها بالعفش وكذلك الشركات وفرش المكاتب, ولكن لا قلق بعد الان مع شركة نقل اثاث بالدمام , فتقدم الشركة خدمة نقل الاثاث بطرق حديثه ومتطورة بدون حدوث كسر في الاثاث وتتميز الشركة بالأمان في النقل لأنها تعتمد على مهارة النجارين لديها وايضا الآلات الحديثة جدا التي تسهل هذه المهمة . 4- بعد فك الاثاث يغلف جيدا حتى لا يتعرض للكسر وللأتربة والخدوش وتلك مهمه الشركة ايضا ثم يتم النقل بكل سهوله وبساطه دون داعى للقلق . 7- لدينا خدمة عملاء ترد على جميع استفساراتكم بخصوص نقل الاثاث ونلبي طلبات اي عميل في اي مكان . Read why is homework important, if you think that doing homework is just a useless waste of time. tweakbox apk is an outsider application installer for iOS gadgets which let iOS clients download Cydia and other astonishing outsider applications for nothing and that too without Jailbreaking their gadgets.